Truth by Kbaig: Murder of Laborers in Baluchistan is Attack over Pakistan!!! Murder of Laborers in Baluchistan is Attack over Pakistan!!! Anti Pakistan forces had targeted Baluchistan since long ago. Sabotaging passengers trains, attacking state especially defense installations, blasting natural gas transmission lines in order to create trouble for public as well as economy of the country. 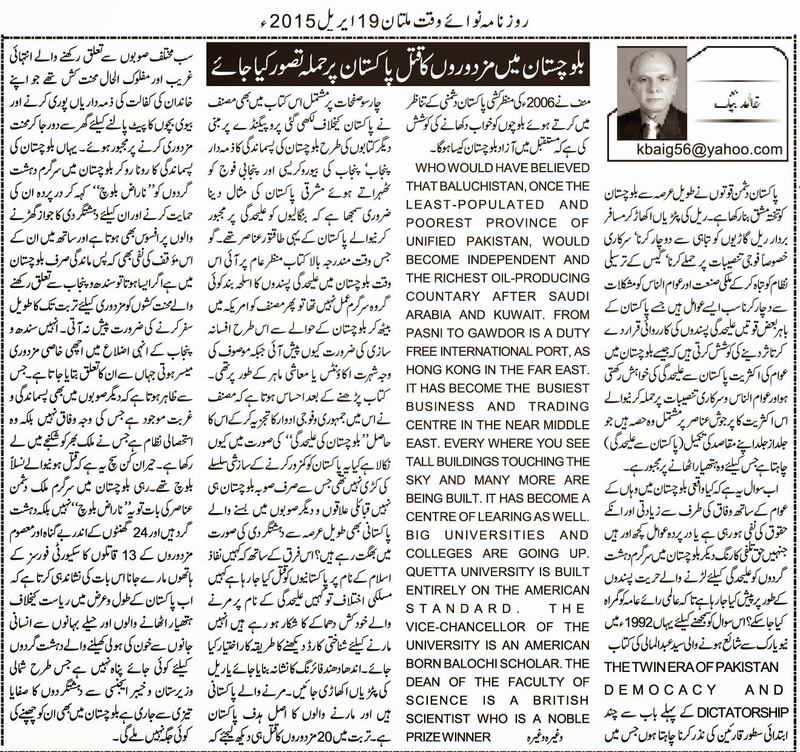 Some forces outside Pakistan attempt to prove all these terrorist activities as activities of separatists fighting for the independence of the Baluchistan and elements involved in such activities are emotional elements of Baloch youth who have been forced to take up arms for quickly achieving their aim (separation). In this book of more than 400 pages like other books consisting of anti-Pakistan propaganda writer had attempted to blame Punjab, Punjabi Bureaucracy and Punjabi army and the example of Eastern Pakistan was quoted as well that Punjab forced Bengalis to get separated from Pakistan. When the book was written there was no armed militant group in Baluchistan then why writer did wrote such a book of fiction while he has expertise in Accounts or Economics. 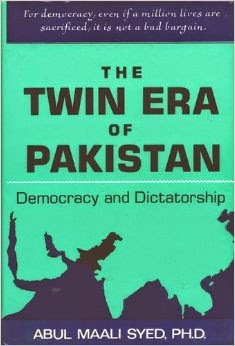 After reading the book one understands that why writer has concluded after comparing democracy and dictatorship in Pakistan in the form of separation of Baluchistan. Is not this a part of the chain of conspiracies to weaken Pakistan which are being faced not only by people of Baluchistan but by all Pakistanis in the form of terrorism? The only difference is that in one place Pakistanis are being killed in the name of imposition of Islam, on the other in the name of Sectarian disputes in the form of suicide bomb blasts, being targeted after checking identity documents, being killed by sabotage of trains etc. no matter what the target are only Pakistanis and the real target of killers is Pakistan. One may consider the murder of 20 Laborers in Turbat, all those who were killed by these terrorists belonged to poor families who were forced to work hard away from their homes in order to make the both ends meet. In such a situation one feels pity over those elements who try to hide and support these terrorists by naming them as “Angry Baloch”; moreover, this also negates the propaganda that only Baluchistan has been left undeveloped; if this is so then laborers from Sind and Punjab would not have been working in Turbat, they might have earned enough from their own districts of Punjab and Sind. This shows that it is not the Federation that is responsible for the under development but the exploitative system that has taken whole country into its clutches. Another point of importance is that those who were murdered by terrorists belonged to Baloch race. As long as these militants are concerned they are not “Angry Baloch” but terrorists. The killing of 13 murderers responsible for murder of laborers just in 24 hours, shows that now terrorists playing with the blood of the innocent Pakistanis will have no hideout in Pakistan. Terrorists and their foreign perpetrators should learn from the short time of search and hunt down of terrorists that Pakistan is neither ready to bear wounds nor external conspiracies will be tolerated anymore.